This chapter presents a comprehensive congestion analysis for 6LoWPAN network through analytical modelling, simulations and testbed results. Congestion occurs when multiple sensor nodes start to send packets concurrently at high data rate or when a node relays many flows across the network. Thus, link collision on the wireless channel and packet overflow at buffer nodes occur in the network . Recently, a few papers have been presented to address congestion in 6LoWPAN networks [2, 3, 4, 5], but none considered congestion assessment and analysis. In , Hull et al. did a testbed experiment in a traditional WSN protocol stack with TinyOS where B-MAC and the single destination DSDV (Destination Sequenced Distance Vector) routing protocol are used. 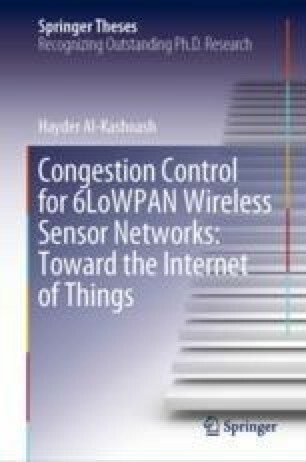 In this chapter, experiments in 6LoWPAN wireless sensor networks using the 6LoWPAN protocol stack and Contiki OS are considered.